For cameras, I had the new to me Sears 35 R|F (a black, re-branded Ricoh 500 G, not pictured), the Cosina CX-2 (with the inaccurate meter that I didn’t yet know about, on the right), and the recently refurbished Lomo LC-A. I think I covered most of the focal lengths needed for a neighborhood barbecue. So… the picnic was set to begin “after Dhuhr.” At this time of year, we pray the Dhuhr prayer at 2pm, so I prayed at the masjid, then went home to fetch cameras, got the call, laded the cameras and I was off. Now, I don’t know about your neighborhood, but in mine, when someone says “after Dhuhr” they usually mean “more like Asr” or “after Dhuhr, go home, have a nap, maybe watch some tele and have a snack, then come.” After 4+ years, I should know this, but I’ve not yet learned my lesson, nor have I broken my habit of always being on time. It earns me some funny looks and means that I barge in on hosts well before they’re really expecting anyone, and also means I spend a good deal of time just standing or sitting around. After 15 minutes or so, Hamza, the masjid security guy, arrived with a buddy. Note the difference between 32 (Lomo LC-A, on the left (yes, I missed focus)), 35 (Cosina CX-2, center) and 40 (Sears 35 R|F, right). (And ignore the exposure variations, for now). And by 3 or 3:30, more guests had arrived, the meat was cooking (in many dozens of batches) and the party mostly got started. I mostly shot pictures of the chef as he worked. He hired a couple of helpers to put the chicken (with his secret blend of who-knows-how-many herbs and spices) onto long, sword-like skewers, that he then laid across a long, shallow wood-burning fire pit. 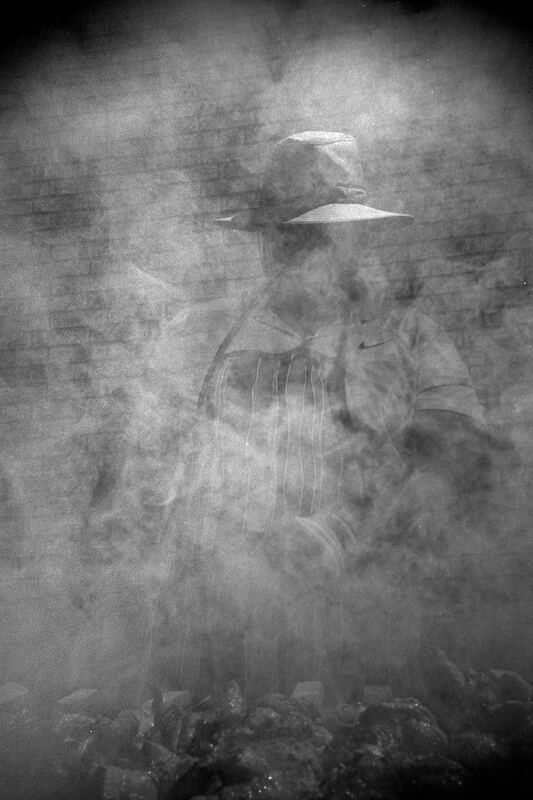 It was quite a scene, especially when he flipped the chicken and the smoke started billowing. When the meat was cooked, he raked it off the swords into a bucket, sent the bucket to the serving line (of which I was largely unaware), and sent the swords back to be reloaded. I’m not sure how many times they did this dance… a dozen, maybe? Two dozen? I shot for awhile, stood around for awhile, and then, I realized there were a bunch of brothers, standing in the driveway of a house next to the park, screened behind some tall shrubs. I tried to make the best of it. Honest, I did. And I got out of it about 4:45, and ate my “lunch” about 5. I did get a few decent shots, though. I’m particularly happy with one from the LC-A. It sometimes pays to get down low, and accept a bunch of smoke in your face. So. Kosmo Foto Mono… It’s a decent film. I think it’s a Foma rebrand, but can’t be sure. Stephen Dowling, the “creator” of Kosmo Foto Mono is famously tight lipped about which film he’s rebranding. It’s not a case of bringing something back, like Japan Camera Hunter did with his JCH Street Pan. Kosmo is a straight rebrand, albeit one with perhaps the best packaging in film photography today. So. Three rolls, one from a camera with a broken meter, one from the LC-A, and one from a new-to-me camera, all developed in the same chemicals at the same time, probably isn’t sufficient for a review, but I like the film. It performed well in the sunny conditions of the park on that early May day. I think the Sears 35 R|F did it the most justice. Images shot with that camera were razor sharp and beautifully contrasty. The LC-A didn’t perform up to its usual standards… I’m not sure what it was, maybe it was too bright out? Maybe the refurb or shipping back from refurb did something to it? I don’t know. It performed fine in my first tests, but who knows. And the Cosina, well, the meter is straight broken. It works perfectly at ISO400, but as soon as the little apertures start covering it, it starts overexposing by multiple stops. In fact, it might just go to default 1/45th on everything (though I don’t think that’s the case, as it seems to vary the shutter speed, just at 3-5 stops over). Ok. So Kosmo Foto Mono. The grain is smooth and pleasant, the film handles a variety of subjects well, and has some decent latitude. Processing times were a bit fast for my liking, but it went fine in Ilfotec HC 1:31 for 5.5 minutes, and it dried flat and smooth, so no complaints. Overall, I’ll give it a solid 4 stars. It’s really a beautiful film, with some of the best packaging in the business, and the film sings with the right camera. I might buy it again, but I don’t know. I’ll have to think on it some. It’s not horribly expensive, even shipped over from Europe, and it’s currently in stock… but I’m on a photo-related gear acquisition moratorium for Ramadan, so it won’t be for the next few weeks, and by then, who knows. If you’ve shot Kosmo Foto Mono, what do you think of it? As for the neighborhood picnic… may Allah grant me patience and bless the brothers and sisters who worked so hard to put it on, Ameen. Nice to stumble across this – I’m glad you had fun with the film. And damn if I’m not hungry for barbecue, suddenly (despite just eating lunch)!